The Richmond Hill Live Steamers is a non-profit live-steam club whose members are dedicated to building and operating scale model steam, electric and diesel locomotives. R.H.L.S. 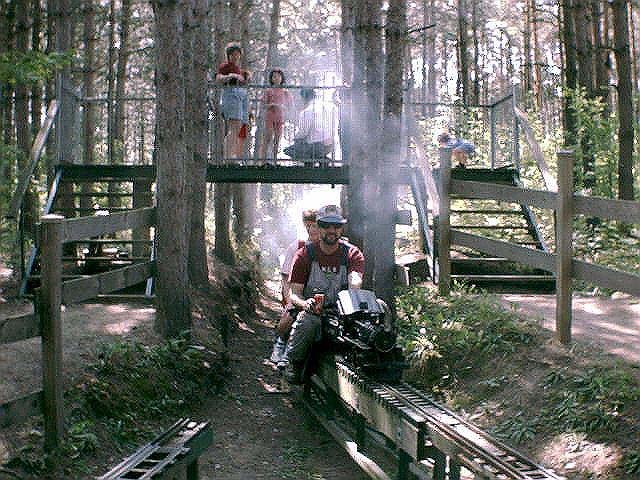 was formed by a small group of model engineers who decided they would like to operate their own track. Some of the founding members are still actively involved in the club and have been a driving force which has brought the club to the extensive facility that we all enjoy today. Through subscriptions, donations and not a little hard work over the past years, our track site, just north of Ballantrae, has been developed into the best facility in Ontario. We have 3 gauges of track. 3 1/2" & 4 3/4" gauges run on another track we call "The High Line". The engines are powered by steam generated by burning coal. Some are battery powered electric engines and can pull several children or two or three adults. 7 1/4" gauge is on a "Ground Level" track. 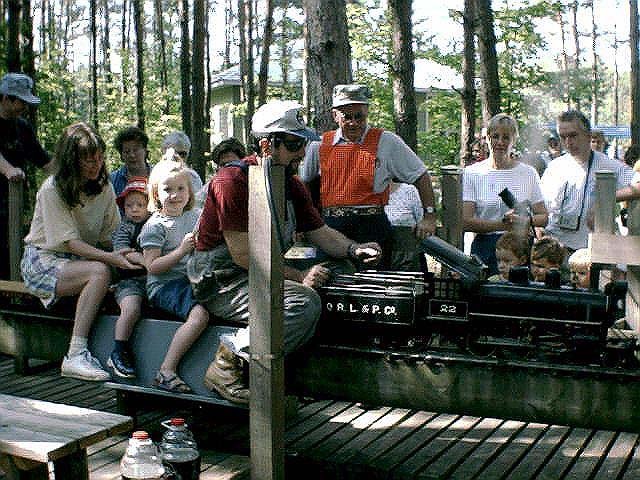 We have steam, electric & diesel powered engines which are capable of pulling 10 to 20 adults. This track is approximately 1800' long. The whole site is situated in trees on a 3 3/4 acre lot on the southwest corner of St. John's Side Road and McCowan. In past years we have staged several Open House events during the summer months, offering rides to the public in return for small donations. During the last few years, the club has become such a popular attraction, that the crowds could not be accommodated in a timely manner, or with the acceptable margin of safety. Regrettably the club has had to take the decision not to offer our usual public open house events. A limited number of Birthday Parties or special events may be arranged by appointment. See details below. Doors Open Stouffville on the first Saturday in June. Thank you for keeping live steam alive! ~ Use of the outside barbecue, propane included. Just bring your food and drinks. (But please clean the BBQ and take away all your garbage). Rides are very safe but kids still need to be sensible. We suggest that you organise some open air games to help the kids "blow of steam" before they get on the trains. We also ask that you kindly take all garbage with you when you leave. We are in the country and cannot easily dispose of garbage. As RHLS is a private, not for profit club we are not permitted to charge for our services. We love giving the kids train rides but, must rely on donations to help maintain the facilities and keep the trains running. Our Party Coordinator will be happy to discuss details with you when making your reservation. A limited number of dates we hold birthday parties on usually book up very quickly. If you are interested, please email our Party Coordinator to see if we can accommodate your request. We normally start taking reservations each year on January 1st. Questions and Reservations: please contact: birthdaytrains@gmail.com for details. Meetings are usually held on the third Sunday of the summer months at noon in the Club House located on the property. - please contact Eric Motton at fmotton@yahoo.com for club details. The club operates on approximately 3 3/4 acres of treed property. This large wooded area has two sections of track which travel through trees and over bridges. It makes for a very peaceful ride! All donations offered to the club are used to maintain the club's property. ~ Thank you for keeping live steam alive! Website Designed and Maintained by: Mingweb: contact can be made through RHLS's contact person. This web site including all of its text, photographs, pages, content, logos and content are owned by Richmond Hill Live Steamers and are "Copyright© by Richmond Hill Live Steamers" except where otherwise stated. No part of these pages may be published in any form without the express written permission from the club's current executive. "Publishing" includes copying for electronic redistribution (including publishing articles on other webpages or email) or printed copies. No part of these pages maybe sold without the express written permission of the club's current executive. You may only print a copy for your own personal use. Violation of this copyright is illegal. All articles on this webpage are written by RHLS members or the president. This site contains links to other sites but Richmond Hill Live Steamers is not responsible for the privacy practices or the content of these other web sites. It would be appreciated if you provide a link back to this page. This is the correct way to share the content of this website. This page born and first published Spring 2001. August 2009 host moved from geocities to tripod. RailServe ~ from collectibles to games, music to newsgroups, cams to photos, themes to screensavers, etc.